The Image Meta WordPress Plugin allows you to control how image IPTC information gets processed when you upload an image. For example, if you use an image processing program like Picasa, iPhoto, or Photoshop to add captions to your images, these captions are embedded into the image file in the IPTC caption (or title). Picasa only allows you to set the caption. As of WordPress 3.0, if the caption is set, but not the title, it uses the caption as the title of the image, and leaves the alt text, caption, and description fields blank. If you then insert a gallery into a post, no captions will be shown for the pictures. 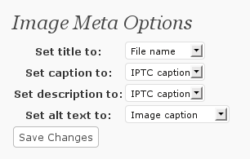 The Image Meta plugin allows you to specify what wordpress should do with the IPTC caption. I like to have the title of each image be set to the filename, the set the alt text, caption, and description to the IPTC caption.